Our resolution of eating more fish and veg and less meat has been good- we’ve actually kept to it! Tonight is no exception, and a new recipe too. 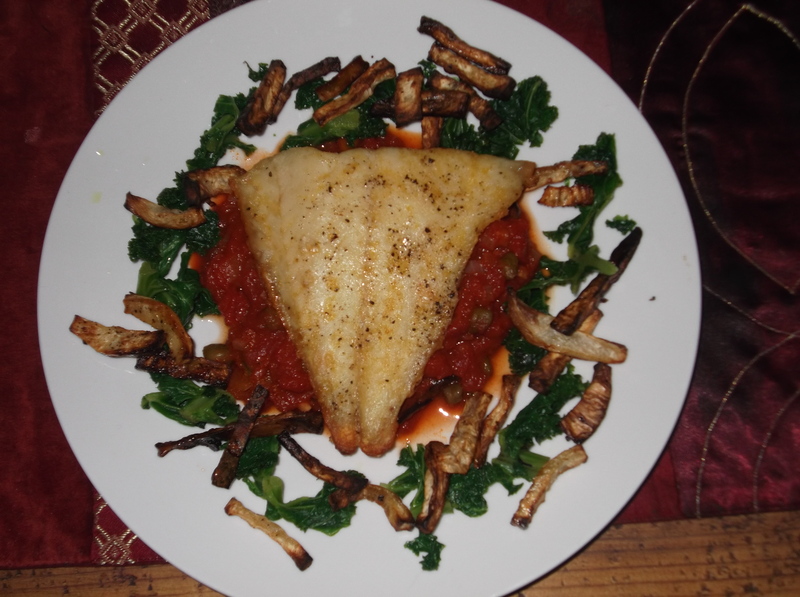 This is pan-fried hake on a puttanesca sauce and celeriac chips- and really yummy it was too. You could use any white fish: it was simply seasoned and pan fried in a very little drop of olive oil. When cooked all the way through it had a squeeze of lemon juice, and that was it. The puttanesca sauce was delicious, although I doubt that it’s all that authentic. I heated a little oilve oil in a saute pan and sweated down a small, chopped onion and 2 cloves of garlic. When soft I added 2 small red chillis, chopped finely. To this I added 2 tins of tomatoes and left it to bubble away for about 20 mins. 1 tbsp of capers and about 12 olives (green and black), sliced, were added and the sauce bubbled away for about another 10 mins until quite thick. To be honest the celeriac chips were ok but I doubt I’d bother again- they didn’t go as crisp as potatoes and Colin felt they were too sweet. Maybe some greens would be good to mop up the sauce. All in all a good, tasty and healthy dinner. Washed down with a nice bottle of red!